Halloween has come and gone, and now that we’ve all eaten our weight in mini Snickers bars it’s time to step up our candy game. 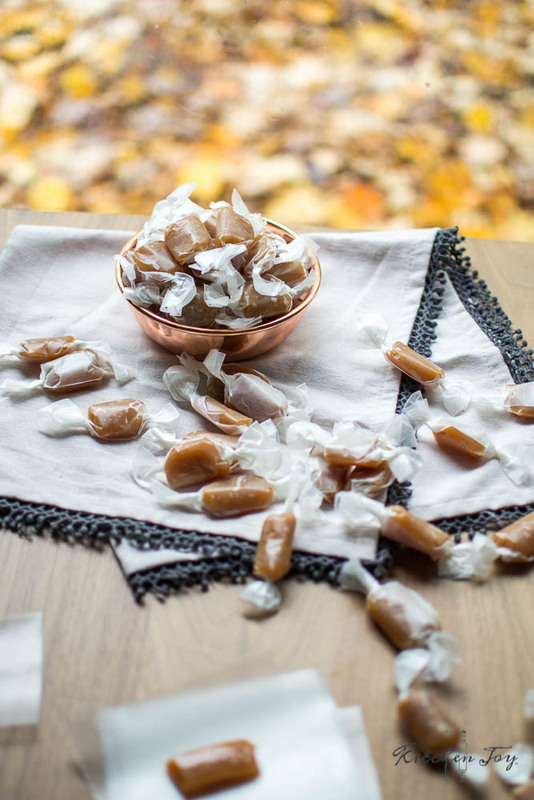 Homemade candy is in a whole other realm than store-bought candies. 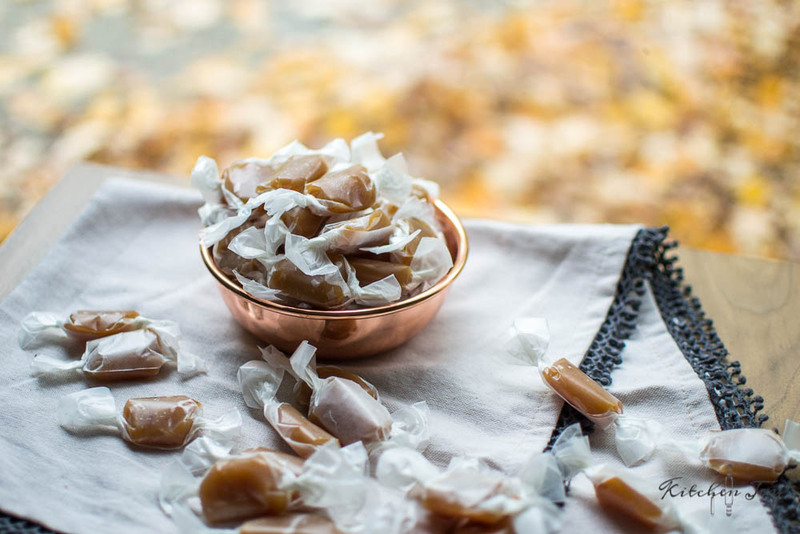 This recipe for Apple Cider Caramels is one you’ll want to share, but might just find yourself hiding in the laundry room snacking away at them or squirreling them away in the hidden pockets of your diaper bag (I plead the 5th on that one…). They’re like bite size apple pie and since it’s full blown pumpkin spice latte season, I feel like poor old apple cider needs some love. Apple cider is having a serious moment in our house these days. My poor Hubby keeps asking me when he opens the fridge if the cider is “fair game” or not. There may or may not be an amazing pork chop recipe coming at you next week that involves apple cider. These apple cider caramels are perfectly soft and sticky at room temperature and a bit more firm right out of the fridge. I prefer cutting them when they’re chilled in the refrigerator for a little while first. Enjoy them at whichever temperature you wish. Either way they’re not that awkwardly hard, overly sticky kind of candy that necessitates having your dentist on speed dial. Combine cinnamon and sea salt in a small bowl and set aside. Line an 8x8-inch cake pan with parchment paper. While cider is reducing, measure out remaining ingredients. Once cider has reduced, remove from heat and stir in butter, sugar, brown sugar, and heavy cream. Attach a candy thermometer to the side of the pan and return to heat. Heat mixture, stirring frequently until temperature reaches 235°F (soft ball stage). This takes about 5 minutes. Remove from heat and add cinnamon and salt mixture, stirring until evenly disbursed. Carefully pour caramel mixture into parchment-lined pan. Let sit at room temperature for a few hours until set, or in the refrigerator for an hour until set. Once caramel has set, lift up on the parchment paper to remove caramel and place on a cutting board. Lightly oil a very sharp knife and cut caramel into small squares. 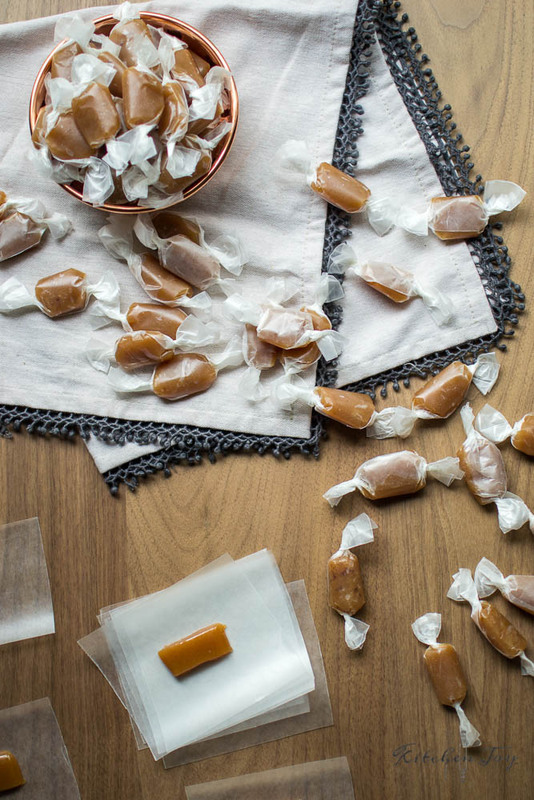 Wrap caramels in wax paper cut into 3-inch squares, and twist ends to seal. Store wrapped caramels in an airtight container for up to two weeks. This recipe first appeared on Kitchen Joy™. As always, thanks for stopping by my site. So glad you’re here! P.S. 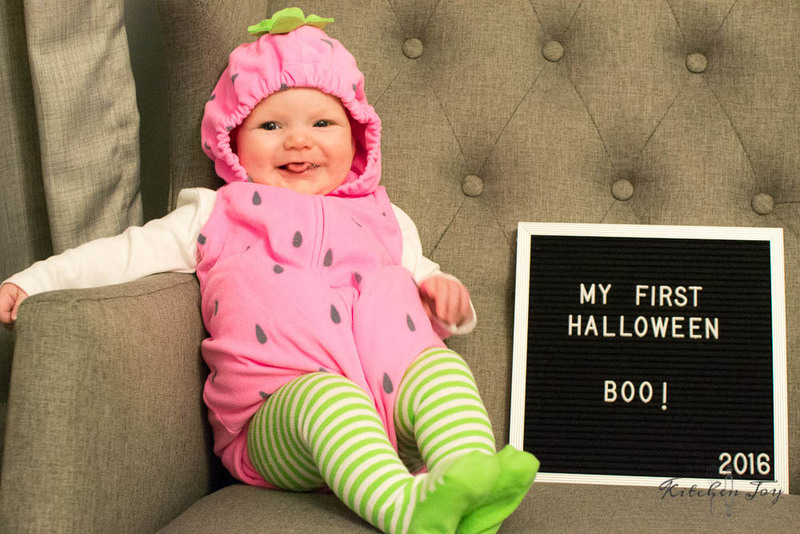 How cute is my little strawberry on her first Halloween?